Buildings & Landscapes is the leading source for scholarly work on vernacular architecture of North America and beyond. The journal continues VAF’s tradition of scholarly publication going back to the first Perspectives in Vernacular Architecture in 1982. Published through the University of Minnesota Press since 2007, the journal moved from one to two issues per year in 2009. Buildings & Landscapes examines the places that people build and experience every day: houses and cities, farmsteads and alleys, churches and courthouses, subdivisions and shopping malls. The journal’s contributorsundefinedhistorians and architectural historians, preservationists and architects, geographers, anthropologists and folklorists, and others whose work involves documenting, analyzing, and interpreting vernacular formsundefinedapproach the built environment as a windows into human life and culture, basing their scholarship on both fieldwork and archival research. The editors encourage submission of articles that explore the ways the built environment shapes everyday life within and beyond North America. Outside USA add $5.00 for each year's subscription. 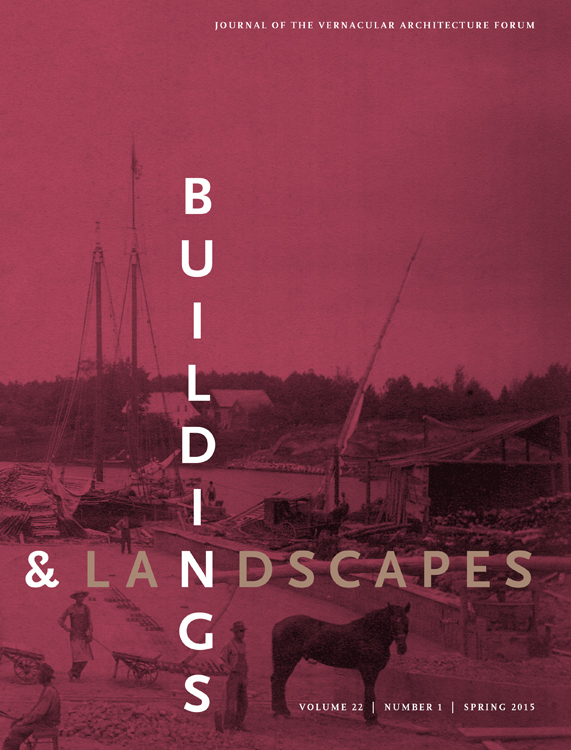 Past issues of Buildings & Landscapes can be purchased from the University of Minnesota Press. Buildings & Landscapes is also available as full text through databases including Project MUSE, JSTOR, EBSCO (H.W. Wilson) Art Full Text and Gale's InfoTrac Academic OneFile. Browse complete tables of contents on our Buildings & Landscapes Backlist page. See information on the call for papers on the Submissions page.